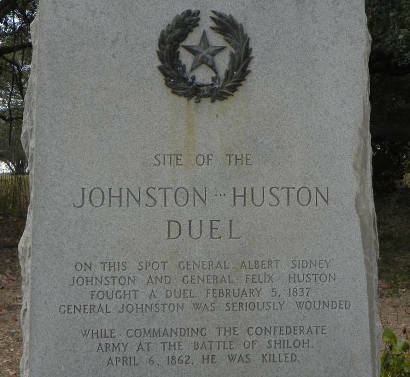 Dueling, and The Huston-Johnston Duel in Feb. 5, 1837. Maybe the historical image of Texas that endures along with cowboys and Indians and the Alamo is the classic gunfight. The showdown at high noon on the dusty main street of a Western town has its roots in the �gentlemanly� duels cultivated almost to an art form in the South for decades. Dueling was a major issue during the Republic of Texas years when the army tried to crack down on the practice, which usually resulted in the loss of at least one fighter to what might be called unfriendly friendly fire. Albert Sidney Johnston, Commander in Chief of the Army following Sam Houston, was particularly vexed by duels. He once had to slap the pistol from one officer�s hand to keep him from shooting another officer. Another time, a colonel called on Johnston to serve as an impartial judge in an impending duel with a rival officer. Before Johnston could remind the colonel that dueling was against army regulations, the other duelist arrived and opened fire. Though Johnston was largely responsible for enforcing the Texas Army�s ban on dueling, he was not one to let a challenge to his own honor go unanswered. When General Felix Huston challenged Johnston to a duel, Johnston accepted. Johnston and Huston could both be termed �Fighting Kentuckians� since both men hailed for that state. Their duel came on Feb. 5, 1837, not long after Sam Houston appointed Johnston as the Texas�s Army�s senior brigadier general, making him the Army commander. Huston was forced to relinquish command by becoming a junior brigadier general. Huston�s foul mood over the matter turned murderous when Johnston had the general order announcing his appointment read to the assembled troops. Huston was so offended he challenged Johnston to a duel, and Johnston accepted. The duelists met on the Lavaca River in Jackson County, near a large oak tree that has become known as Dueling Oak, to settle a matter that, to our eyes now, seems to have already been settled. In recognition of Huston�s reputation as an expert marksman, Johnson�s second (sort of a reserve duelist as it were) suggested that the two men agree to fire at each other from the hip, and that is how that particular duel was fought. Johnston intended to wait until Huston took aim before firing his own pistol, hoping the sound of his gun would upset Huston�s aim and timing. Johnston and Huston each fired three times at the other until, on the third exchange, Huston shot Johnston through the hip. The attending physician, noting that the ball had injured Johnston�s sciatic nerve, assured Johnston that he was going to die. Huston approached his fallen foe, offered condolences and said he would be happy to serve under him. How much comfort this actually gave Johnston isn�t known, but he never held the duel or its results against Huston. Johnston lingered near death for several months and eventually recovered and resumed command of the Texas troops. He would go on to wider fame as a Confederate General during the Civil War. Huston soon left the Army and returned to the United States. Texas passed a bill that outlawed dueling in 1840, and for the next 99 years all state officials were required to take an oath asserting that they had never taken part in a duel. By that time the gentlemanly dueling pistols had been replaced by rapid fire revolvers and eventually machine guns, which made �duels� more a matter of superior firepower and a good place to take cover. Nearsighted W.T. Jack might have actually seen a glimpse of that future. When he was challenged to a duel he agreed but only if the duel took place with shotguns across a table. Under those terms, dueling would never have been much of a problem in the Texas or any other army.